This time last year, Sydney and Melbourne were in the middle of a property market boom and every property market analyst in Australia was predicted that those same cities would again finish top-of-the- table in 2017. Everyone except Propertyology, that is – we were the one black sheep who made the bold prediction that Hobart would be Australia’s best-performed capital city for 2017 [refer here]. Similarly, we also said that several regional locations would perform well. Now that the jury is out, let’s review what did happen in 2017 and see what our crystal ball says for the year ahead. Melbourne (12%) and Sydney (10%) produced their fifth consecutive year of strong growth. Canberra (7%) was the surprise packet, while Adelaide was also steady. On the other hand, Perth & Darwin had their third year of declining prices. Brisbane (3%) was again underwhelming. Australia’s third biggest city has only seen 35% compound growth over the 9 years since the onset of the GFC while Sydney, Melbourne and Hobart produced that in just 2-3 years. Australia’s most affordable capital city, Hobart, has been the clear stand out in 2017 with 14.3% growth for the 12 months ending September 2017. 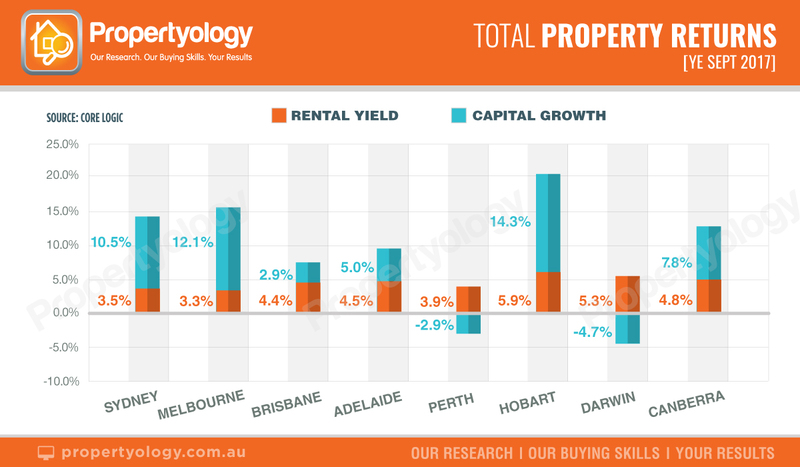 Given that Hobart also has the best rental yields in the country, the total return (capital growth + yield) is 5% more than Melbourne and 7% more than Sydney. With 3 months of data yet to unfold to round out the 2017 calendar year, we believe Hobart will end 2017 with at least 16% price growth. That will make it the largest annual increase by any capital city in 10 years. As predicted by Propertyology when we began investing in Hobart in mid-2014, the Tasmanian economy has been the most improved in Australia by a long streak and, as usually happens, its property market followed suit. The Apple Isle has some of the best agricultural products and tourism experiences in the world; Hobart is also a beautiful university city. But it’s only recently that people outside of Tasmania have grown to appreciate this. Chinese President, Xi Jinping, made a special visit to Hobart (and only Hobart) in 2014 to foster business relationships and now the secret of Tasmania is well and truly out. The rate of employment growth in Hobart over the last year was 4 times the national average and double the next best capital city. The economy doesn’t appear to be slowing down either; job advertisements have a very steep trajectory. Records keep being broken in retail trade (the cash registers are ringing loud) and visitor volumes (domestic and international). 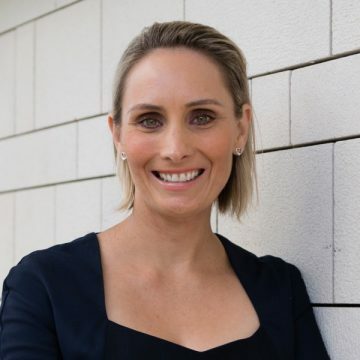 The strong economy and high consumer confidence means that locals are keen to transact in property and there certainly aren’t any affordability barriers. Newcastle (12.7%) and Wollongong (15.5%) again benefitted from the Sydney knock-on effect. Lifestyle markets like Byron Bay (14.1%) and Port Macquarie (9.3%) also performed very well. Lesser-known New South Wales locations such as Maitland (6.2%), Bathurst (6.5%), Dubbo (5.3%), and Orange (4.7%) performed better than 4 out 8 capital cities. The tomato capital of Australia, Guyra, had a stellar year with 16% growth. 2017 was the fifth year of Sydney and Melbourne’s growth cycle and, even without APRA’s recent credit-tightening intervention, logic would suggest that the property markets of Australia’s two most expensive cities are due to moderate. While there are no immediate signs of Sydney’s economy slowing down, auction clearance rates and sale volumes suggest that Sydney’s property market had flattened right out by the end of 2017. Property prices appear to be well out of reach of most of the buying public and local sentiment has been dampened by suggestions from some economists that prices could fall by as much as 10%. There are real risks with Sydney’s market however, all things being equal, Propertyology’s view is that Sydney property prices are likely to be largely flat for some years. Our analysis of building approval data is such that we see potential for unit prices to ease in some parts of Sydney. Melbourne ended 2017 stronger than Sydney but it’s noted that its rate of growth across this cycle hasn’t been as strong as Sydney. For us, 2018 was always going to be the year that would determine the impact of 10,000s of job losses linked to the closure of Australia’s car manufacturing industry. Stronger than expected population growth combined with recent improvements to Victoria’s first home grant are cause for Propertyology to be less bearish than our initial assessment. That said, there’s every chance that Melbourne’s market will be flat by the end of 2018. Propertyology believes that Hobart is the only capital city likely to produce double-digit price growth in 2018. That said, 5 out of 8 capital cities have a better outlook for the next 3 years than the last 3 years. Adelaide, Brisbane, Perth and Darwin have all been underwhelming since 2010. Of these, Adelaide and Brisbane are the most likely to next commence their growth cycles although we are still waiting for tangible indicators for that to play out. 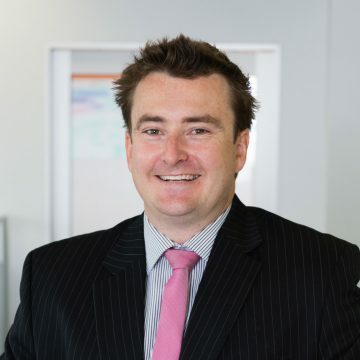 There is some suggestion that Perth’s economy has finally stabilised although the declining interstate migration remains a concern. 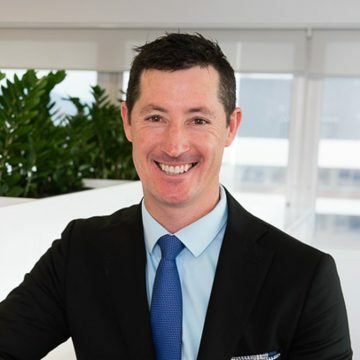 Propertyology’s view is that Perth still has very high volumes of rental and resale stock for price growth to reoccur – an improvement to neutral territory (perhaps for a prolonged period) is our forecast. Darwin’s one and only major infrastructure project, the $40 billion Ichthys LNG plant, is scheduled for completion in early-2018 and the cupboard is currently bare for new infrastructure projects to replace the jobs that peaked at 8,000 in 2016. We believe that a 4th year of property price falls will occur in 2018. 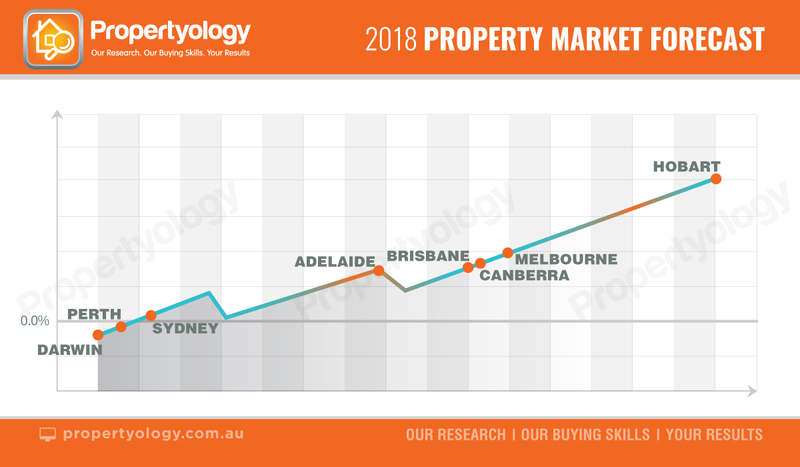 By the end of 2018, Propertyology believes that there will be little difference in annual property price growth between Adelaide, Brisbane, Canberra and Melbourne. Whichever of these cities finishes the year in second place is still likely to be a long way behind Hobart! Without exception, history has taught us that there’s several high-performers among regional cities every year and 2018 will be no exception. 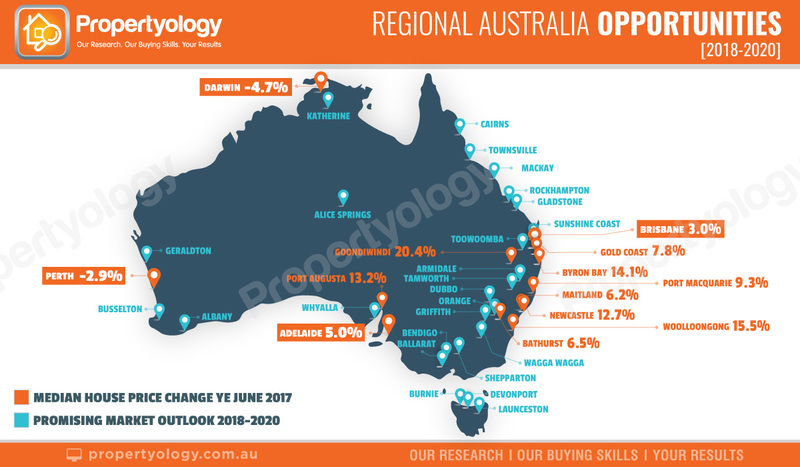 In fact, Propertyology believes that the best opportunities for investors over the next few years will be found in regional Australia, not capital cities. The rise of Asia’s middle class and the resultant changes with dietary preferences represents an exciting future for Australian agriculture with a direct positive impact on property markets of relevant communities. Indirect benefits will unfold on the property markets of regional locations with food manufacturing businesses such as packaged protein food products, wine, and abattoirs. In alphabetical order, regional locations which have improving fundamentals include Albany, Alice Springs, Armidale, Ballarat, Bendigo, Bunbury, Bundaberg, Burnie, Busselton, Cairns, Devonport, Dubbo, Geraldton, Gladstone, Gold Coast, Griffith, Hervey Bay, Katherine, Launceston, Mackay, Orange, Parkes, Port Augusta, Port Lincoln, Rockhampton, Shepparton, Sunshine Coast, Tamworth, Toowoomba, Townsville, Wagga Wagga, and Whyalla. Propertyology is already helping our clients to invest in some of these locations at extremely affordable prices. Will Australia’s apartment love affair end like The Bachelor?